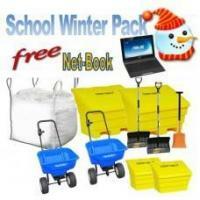 Special Offer: Buy our School Winter Pack and receive a FREE Netbook. The School winter pack has everything you need to ensure the safety of students, staff and visitors to your school. The 6 Cu Ft grit bins are available in a wide range of colours ranging from high visibility yellow to subtle colours such as stone effect or sandstone. The bins feature a sloped lid which prevents snow and ice settling on the lid. 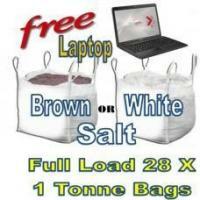 This ensures ease of use throughout winter and also allows rainwater to run off. The bins can also be used to store other items such as gardening tools, car washing equipment or compost when not being used for storing rock salt, making them a multi-purpose storage solution. The 2 Cu Ft grit bins are available in a wide range of colours ranging from high visibility yellow to subtle colours such as stone effect or sandstone. The bins feature a sloped lid which prevents snow and ice settling on the lid. This ensures ease of use throughout winter and also allows rainwater to run off. The bins can also be used to store other items such as gardening tools, car washing equipment or compost when not being used for storing rock salt, making them a multi-purpose storage solution. The Earthway ev-n-spred 2040 PiPlus is a high output broadcast salt spreader that offers all the benefits of a commercial salt spreader but hasn’t got the high price these carry. The spreader is manufactured from corrosion resistant stainless steel where necessary and features a 30 kg capacity plastic hopper. Other notable features are a super duty gearbox, high output shut off system, heavy duty epoxy powder coated chassis and 9” (23cm) pneumatic tyres with plastic rims. 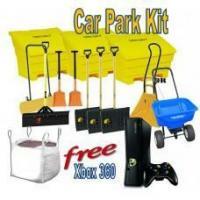 The snow shovel is manufactured from polymer and is purpose built for clearing snow. It features a reinforced T grip for easy operation. Polymer is more durable than wood or metal snow shovels as it will not rot or rust.